You are currently browsing the monthly archive for December 2006. It seems the weather here in the UK is throwing a tantrum at the thought of leaving another year behind. Driving wind, pouring rain, all things that are terrific for getting the grayling going. I’ve been staying with family for the past week or so, and have finally got into tying up some flies. Actually, that’s possibly stetching it a little, because these fellas are serious bomb bugs. When grayling bugging I quite often use a very heavy ‘nymph’ on the middle dropper which acts like an anchor, taking the whole cast down quickly. These things don’t resemble any kind of traditional fly fishing creation. They’re big and nasty, and are likely to cause mild concussion if your casting’s a bit off. 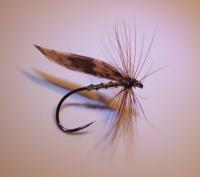 A running saga in my fising for the last year or two has been the quest for the perfect fly line – leader system. It’s been an epic journey, but perhaps the end of the road is near. For 90% or more of my fishing I use a floating line with a tapered mono leader. In the dark old days I was conned into using those evil braided loops to connect the leader to the fly line with a loop-to-loop knot. It wasn’t pretty but it sufficed for a year or two. Then I became aware of other ways of setting up this connection, and I’ve been experimenting for a while now. The very neatest method I’ve found is the Dave Whitlock superglue connection. This definitely provides the smoothest connection I’ve seen. 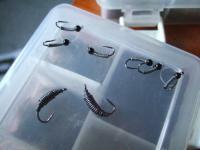 The fly line – leader join usually slides seamlessly through the rod rings. Having using this for most of last season, there are only two points I’m not convinced about. The first is that the fly line tends to crack where the leader is inserted. 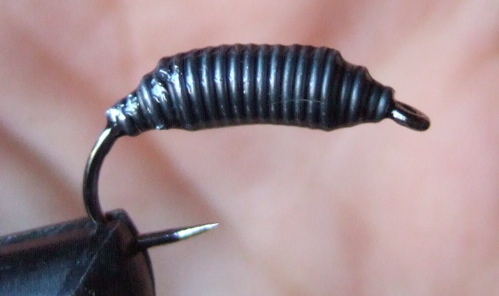 This may be because the extra stiffness imparted to the fly line at the join leads to a hinging effect, so that repeated casting degrades the connection. Talking to a pal about this the other day it seems he hasn’t had a problem. I’m pretty sure this must therefore be down to my sickly tight razor-loops. The fly line cracking has the knock-on effect of encouraging the tip to sink slightly, which can be annoying. Last weekend the weather man suggested that there might be a short break between the storms that have been battering the UK for the last couple of months. So I had a quick gander at one of my OS maps and choose a nice route near the town of Crianlarich. As is always the case in winter, time was the main concern. If you’re lucky you might get six or seven hours of walkable daylight. But you’ll probably have to get up several hours before dawn if you’re going to get to the hill by the cutomery mid-morning. My pal Alistair sent me a message a couple of days ago instructing me, at pain of no new fishing gear for a whole year, to take the batton of personal discovery and post 5 things about myself. Apparently it’s all part of a the lastest ‘discover your blogger’ incentive, as encouraged by the Dali Lama Himself. I’ve heard Hulk Hogan is getting involved as well so there’s really no reason not to take part. I like curry. Rogan josh is a favourite. It needs to be made with fresh tomatos, and if done right is just sensational. There’s a cracking curry place in Edinburgh known only to special folks who frequent it with religious vigour. I’d tell you but would then have to kill you with a giant chilli pepper (hint: it’s in Nicholson Square). I live in Scotland now, and half of my ancestry are Scottish, but I wasn’t born here, and in fact grew up in the far East. Maybe this is why I seem to appreciate the glory of trout fishing as much as anyone (though I secretly feel more..). The other half of my family are from the wonders of Manchester (in fact Oldham, even better). You decide which of these places I spend most time blubbering on about. Despite clearly overloading number 3) above, factoid number 4) is that I think breakfast is important. A good bowl of fruit and fibre, a couple of THICK slices of brown toast liberally coated in chocolate spread and homemade jam is a classic. People, don’t buy pre-sliced bread. Despite what people say sliced bread simply isn’t the best thing since whatever the best thing used to be. It’s anemic and possibly from the devil himself. You want good bread, it’s important. I’m giving serious thought to becomming a trout bum (for a couple of years at least) when my current tenure as a ‘scientist’ (haha) is over. You only live once (generally accepted by most upstanding biologists, I’m lead to belive) and the word ‘priorities’ seems to have been flashing loud and clear in bright green letters the front of my conciousness of late. I’ve made ‘trout bum’ sound like a job description, which is rediculous and far too specific. Generally bumming around and fishing a lot is probably a better decription. Well well, that was fun. You three blog readers out there now know what’s important about Mr Tamanawis, and can adjust your expectations accordingly. Have a nice day folks. The thing that’s so bad about gear lust is that even though you know it’s bad, you just can’t help yourself. My pal Alistair recently sowed the seed of reel-lust in my little fisherbrain. Up to then I’d been perfectly content with my Shakespeare Condex fly reels, which at 20 quid a pop are considerably cheaper than most fly lines. In a conversation that centred largly on nice, expensive fishing tackle, it became clear that he has a one-up on me in the reel department, fishing as he does with a glorious, shiny Vossler DC-series job. I think we both appreciated the mild irony of my combination of a Sage XP with a 20 quid Shakespeare reel. To be honest it’s the kind of irony I get a bit of a kick out of, but since the conversation I’ve been gradually degenerating into pitiful gear lust. Combine this with a new found lust for an expensive fly line and it’s all going down hill. Things got even worse this weekend when I was in one of the big fishing tackle shops in Glasgow. I hadn’t been to any fishing shops for a good while, so I slowly worked my way through the fly tying department picking up bits and bobs that I obviously didn’t need. Then at the end of one of the isles was the clear-out row of Sage XP’s. And right on the end was an absolute beauty, a 7’6″ for a 4 weight. Holding it in the hand it felt ALIVE. She (she was clearly a she) was definitely wispering things to me. Things about how crisp she would be casting a little beetle under the overhanging willow tree on my favouite stretch of my favourite urban river. About how smoothly she would put out a nice dull-green-coloured (important) double taper line into the rudest breeze. This conversation went on and on as I felt myself being overtaken by the rigours of full blown gear lust. Perspective! I shouted, have some flaming Perspective! Even if she was a she and even if you could talk to her there’s no way she would stoop to being cast on an Urban River. She was an XP, and XP’s are for the rich boys aren’t they? Rich boys don’t fish on dirty urban rivers. She would not be satisfied, not with shopping trollies and burnt out cars. She would cheat and find a man who fished on a real river. I’m telling you, there’s a big part of me that hates this kind of pathetic lust for gear. The lust for reels is possibly the worst of all: you never need a great reel, not in my kind of fishing and not like you need a great rod. Yet you really admire a nice one, you spin the spool and listen closely. I think a beautiful reel is more beautiful than a beautiful rod. Just look at this, and this. Reel-lust is gear lust of the purest kind. You always manage to convince yourself that if only you can plump up the cash for this ‘one reel’, or ‘one rod’ or ‘one Ferrari’, that life will feel complete and that you will reach the next Zen plain of true contentment. But just like an addictive drug the old gear lust comes a-wondering back into your conciousness. It’s not something you’re born with, you aquire it. Exactly like you aquire a taste for cocaine. Just look at my reel-lust. One minute I was fine with a placky job which squeaked and occasionally jammed. Then the allure of a shiny German metal-man invades my life. It’s bad and it’s wrong but it’s not easy to stop.